When you’re going through the daily grind, you can feel as if you’re not achieving very much, as you wade through the treacle of emails, social media posts, bills and deadlines. This is a good time of year to lift your gaze up from the ground and take a birds-eye view of what you’ve done throughout the year. That is what I’m going to do in this post, so that if, God forbid, things go a bit pear shaped in 2015, I can look back at this post and remind myself that the pendulum always swings back in the right direction. I also want to encourage all of you readers to look back on your achievements and be proud. This was a bumper year for workshops. As well as the ones I run myself, I was approached to run workshops by different organisations. In January, I gave a half-day workshop to people with intellectual disabilities at Waterford Institute of Technology. The participants were full of stories were fun and it was a delight from start to finish. I ran an eight-week creative writing course and two intensive one-day workshops for more advanced writers, which all went well, but one of my highlights was the series of workshops I gave for Waterford Libraries. I did half-day workshops in three libraries throughout Waterford and they were well-attended, with lots of enthusiastic writers. Tuesday Miscellany. This was an anthology of writing by Tramore Writers’ Group, filled with poems and stories about nature, family, dieting and much more. I proofread each entry twice, gave critiques to help the authors polish their work and had input into the final choices of work to be included in the anthology. Goodbye Frying Pan, Hello Fire. This was a memoir by Jennylynd James, which chronicled the trials and triumphs of her relocation to Canada. I copy-edited each chapter, checking for spelling, grammar, sentence structure and coherence. I also gave suggestions on the order the chapters should appear in. Upon Your Agony. This was a book of poetry by Matty Tamen, a collection of eloquent, thoughtful poems with a strong political theme. I was the final pair of eyes on this collection, making minor changes and checking for inconsistencies. I scaled down my copywriting activity this year, but hope to do more of it in 2015. I did have a chance to work on some very creative copywriting projects this year. I did a lot of work for a printing company which is launching a service that offers people the chance to create personalised prints using their own photos. As well as writing content for a large website, I got an opportunity to write scripts for two how-to videos which would appear on the site. This was a new challenge, but I was able to draw on the skills I learned when I used to write scripts for radio. I also worked on a unique marketing pitch. I was asked to write a pitch for a big exhibit for children and families in the style of a modern day fairytale. This was also a challenge because I had to balance a whimsical, highly creative writing style with hard facts which would appeal to potential advertisers and reconnect them with their inner child. It’s good to work with people who understand the creativity that a copywriter can bring to the marketing of their company’s products and services. I decided to take the plunge and make my first-ever application for arts funding. It was through a scheme called Arts and Disability Connect, to fund an anthology of writing by visually impaired people. While I wasn’t successful, I did a course with Artlinks on funding applications which helped me to redefine what success means. An unsuccessful funding application does not mean the idea isn’t viable. I can satisfy myself that I did my utmost at the time and that I will be more ready for it next year. I’ve already made a start. I gave a workshop at the National Council for the Blind in Dublin to a group of creative and very well read visually impaired people, and I realised that there’s a huge demand for creative writing among visually impaired people. Another service I hope to develop more in 2015 is my writing consultancy service. It aims to give people who want to write a book a framework that helps them get started and then over the finishing line. I did a session with a man who has an idea for a self help book. We discussed his goal for the book, his potential audience and what message he wanted to get across. Based on what we did in our session, I sent him a report summarising what we discussed and outlining a structure for him to follow, which will make writing the book more manageable. So that’s it. Let’s hope that 2015 will bring more of the same for all of us. I want to thank all of those who read my blog this year, all the people who commented on my blogs and social media posts and all the people who took a leap of faith and hired me as a copywriter, editor and workshop facilitator. I also want to thank all the adults and children who came to my workshops, for their enthusiasm, dedication and inspiration. None of this success would have happened without all of you. What achievements from 2014 are you most proud of? I’d love to hear from you. I’m a lover of LinkedIn. It’s not the coolest of the social networks, but it’s stable and reliable – the information stays still long enough for you to absorb it. I particularly like the groups, as there are lots of lively discussions related to every field you can think of. I was a member of several writers’ groups and while there were many excellent discussions, I felt that they had a Stateside slant. I wished that there was an equivalent group for Irish writers, but there wasn’t one. Feeling the lack, I decided to set up one of my own. I called it Irish Writers, Editors and Publishing Professionals. I wanted the group to be a meeting point for people in the Irish book industry, where they could get information that was relevant to the Irish book market and publishing scene. I wrote up rules, I invited all the Irish book types in my LinkedIn contact list, and I started to post up discussions. I opened up the group to writers, editors, people who owned publishing companies, booksellers, and anyone in a book related post. My definition of Irish is quite loose too. As well as Irish people living in Ireland, it’s open to Irish people living abroad, people from abroad living in Ireland and people whose parents are Irish. Many of the discussions are centred on writing, but there are also discussions about all aspects of publishing, particularly self publishing. We discuss editing techniques, book trends and ways of publicising your writing. I put particularly informative discussions into the Manager’s Choice section, so that they’re easy to access. They contain valuable resources for authors and publishers. For example, there’s information about how to deal with book distributors like Eason and Argosy. When you run a group, you get to write the rules. This gives you great power. I’m able to get rid of any posts that are overly promotional or that contain overly personal remarks. I can decide who can and can’t join the group. People must request to join and if there is no explicit mention of Ireland or the book industry on their profile. I send them a polite note querying their interest in the group. When they reply, I usually accept them. In the first few months, progress was slow. Some bloody mindedness persuaded me to continue, and I kept posting five discussions per week. I had just enough interest to keep it going. I was working on the assumption that for every 10 people who joined, four would never engage, four would never post but would read the posts and two would actually post replies to the discussions. My persistence paid off. As time went on, people joined and were willing to take an active part in the discussion. Now the group is the resource I want it to be. People post valuable information and humorous and insightful comments. There’s a considerable library of Irish-centric book information for people to dip in and out of. In particular, there are some self published authors who are very savvy and generous in sharing their experience. I founded the group in July 2013 and it now has 116 members. If you’re on LinkedIn and you feel you fit the criteria I’ve outlined in the post and you would like to find out more, check out the group. What LinkedIn groups have you found useful in your writing or general book journey? I’m still doing my Winterval creative writing workshops for children, and last Saturday, nine children came to the workshop. Keeping order in a group of that size or larger can be a challenge, so it was lucky that I had a volunteer on hand to help. The challenge for me and for other children’s workshop facilitators is that we’re not their parents or their teachers, and also the workshops are meant to be fun, not like school. But we still have to maintain discipline, to be the bad cop. Even though it’s not a school environment, children need to feel there’s someone in charge. It gives them a feeling of security and they’re more comfortable in this new environment. They’ll be more confident and at ease, and more likely to absorb the skills you’re teaching them. You’re there to befriend you, but not to be their friend, and they’ll respect you more if they feel that boundary is in place. Keeping order helps children write. Here are a few insights I’ve picked up about how to create a disciplined workshop environment. The first 5-10 minutes of a workshop are crucial. This is when you size up the children and they size you up. You need to get the message across to them that you are the leader. By all means, laugh and joke with them, and through your banter, you can demonstrate that you can handle whatever they throw at you. Make sure they know that you are the one in charge. You can do this explicitly, by outlining a few simple rules, or indirectly, through your body language and tone of voice. You can also use this conversation to suss out who your ring leader might be and get them onside, or who will need a little extra encouragement. One of the biggest causes of disruption is when children don’t know what’s expected of them in each exercise. They’ll become frustrated and switch off. Be clear about what end result you want to achieve with the workshop and about the aim of each exercise. Work out how to explain the exercises to the children, and how to break each exercise down into steps so they’re easy for the children to do. One of the other big causes of disruption is boredom. I work with 8-12 year olds and their attention span is quite short. So with this age group, you need lots of activities that change every 5-10 minutes. They also tend to work very quickly, so you need to have fillers on hand. I ask them to draw pictures to accompany their story, which is particularly useful if some finish before others. I also have a few classic games like Hangman and Chinese Whispers on standby, which allow them to let off steam after all that writing. What do you do to maintain order in your children’s workshops? These could apply to all workshops, not just creative writing ones. Stories are woven into the fabric of Christmas. There’s the ancient story of the Nativity and more modern classics like A Christmas Carol and The Night Before Christmas. So when the Winterval Christmas Festival was introduced to my home town of Waterford, I put forward the idea of Christmas creative writing workshops as part of the festival. The workshops are for 8-12 year olds, an age when children are a little old for Santa’s Grotto, but are still excited by Christmas and up for a little Christmas magic. The aim is to have them write a Christmas story in two hours. The first of this year’s workshop took place this Saturday, when two sisters produced two sweet stories. I begin each workshop with a set of warm-up exercises so the children can start gelling with each other and feel comfortable in the environment. They get to try on a funny hat and they talk to each other about the ideal Christmas Day. They also do Christmas-themed 20 Questions. We then start to put the story together, step by step. The first step is to assemble the ingredients. The rough outline of the story is that a reindeer who’s a bit of an underdog gets an unexpected opportunity to be the leader of the reindeer pack that pulls Santa’s sleigh. 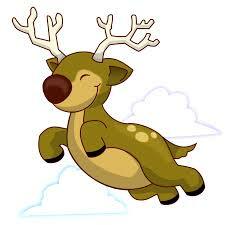 During the flight, the reindeer must avert disaster and save Christmas. The children do a character sketch of their reindeer based on a picture, create a Christmas country for the reindeer to live in, and write the story behind a headline, which becomes the disaster the reindeer must avert. The children then combine all these ingredients to make a plan, which is called a story spine. It’s like the skeleton of a story, and like the skeleton of the body, it holds the story together. The story spine consists of sentences with blanks that the children fill in. An example of a sentence would be. The children then decide what the reason is. Now the children add flesh to their story spine by writing the story proper, with a beginning, middle and end. I explain to the children that the information in the story spine can be used to write the story. I tell them which parts of the story spine correspond to the introduction, which to the middle and which to the end. This structure does seem a little cumbersome at first, but it breaks the story down piece by piece, so it’s not so overwhelming for children. Using the story spine gave the story a natural structure, leading to fully-fleshed out stories with a strong beginning, middle and end. I can only hope writing the story gives the children a feeling of achievement. I feel humbled by the thought that these children are able to produce stories with such imagination and flair, within such a short period of time.